TORONTO, ON--(Marketwired - February 12, 2014) - Marketwired today marked the start of the men's ice hockey tournament at the Sochi Winter Games (#Sochi2014) by launching its Sysomos-powered social media dashboard, "The Quest for Hockey Gold." The dashboard empowers hockey-lovers and sports reporters to follow the tournament's winners and "hosers" on and off the ice with real-time statistics that identify the hockey players and country teams netting the most attention on social media and the countries that are making the most social noise about hockey. 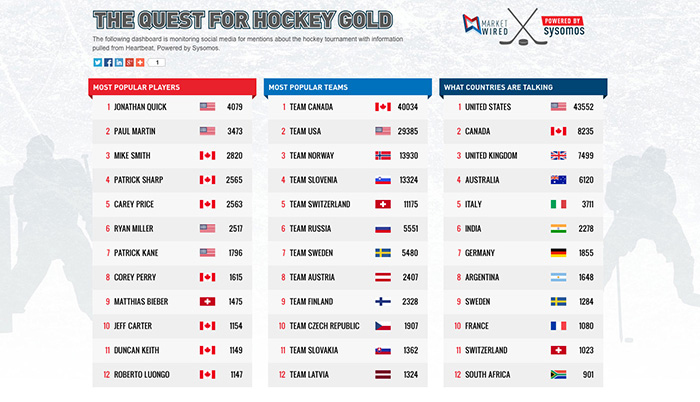 "The Quest for Hockey Gold" dashboard is programmed using Marketwired's Heartbeat, its social listening platform, powered by Sysomos. Heartbeat tracks every player and all 12 of the competing nations' teams, combining them via their application programming interface (API) and feeding the data into the real-time dashboard to create visual rankings for the top 12 in each category. The dashboard is accessible at http://marketwired.com/hockey starting today, and will track the tournament until the gold medal game on February 22nd when the tournament's winners will be decided on the rink and on social media. Partnering with companies of all sizes -- from start-ups to Fortune 500 enterprises -- Marketwired is an innovative, social communications company offering best-in-class, global news distribution and reporting. Powered by Sysomos, Marketwired's products also provide state-of-the-art social media monitoring and analytics. This critical business intelligence provides instant and unlimited access to all social media conversations, allowing brands to see what's happening, why it's happening, and who's driving the conversations. Marketwired is majority-owned by OMERS Private Equity (www.omerspe.com), which manages the private equity activities of OMERS Administration Corporation and today has $6.4 billion of investments under management. OMERS Private Equity is headquartered in Toronto, Canada, with offices in New York and London. Marketwired's social media dashboard, powered by Sysomos, shows the men's Olympic ice hockey players, teams and countries netting the most attention.